TALLADEGA, AL - OCTOBER 15: Dale Earnhardt Jr., driver of the #88 Mountain Dew Chevrolet, and Chase Elliott, driver of the #24 NAPA Chevrolet, lead the field at the star of the Monster Energy NASCAR Cup Series Alabama 500 at Talladega Superspeedway on October 15, 2017 in Talladega, Alabama. Photo by Sarah Crabill/Getty Images. 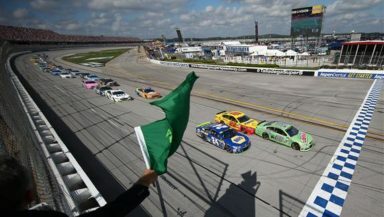 The Monster Energy NASCAR Cup Series and NASCAR Camping World Truck Series will be in action at Talladega Superspeedway while the NASCAR Xfinity Series is off. The Monster Energy Series heads to the second race of the Round of 12 in the NASCAR Playoffs, while the Camping World Truck Series Playoffs enters the final race of the Round of 8. Check out the full schedule below, which is subject to change.